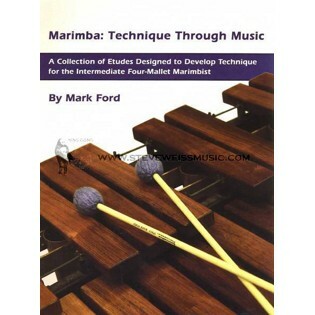 Marimba: Technique Through Music now comes with a supplemental DVD! Author Mark Ford discusses specific marimba stroke techniques, practice tips and performs each of the book’s 16 etudes on the DVD. Designed to help the intermediate four-mallet marimbist, this video is a unique educational resource that delivers more than just exercises and etudes. Students can watch detailed explanations of marimba technique to develop their own performing skills. It was not clean nor neat. The cover had indentations and scratches. This is a great resource for the young marimbist who is developing there musical chops! great condition, great lessons to be learned about 4 mallet technique! Great book for building a good knowledge of playing four mallets! The percussion professor at the University of Alabama at Birmingham (who studied with Mark Ford at East Carolina University) introduced me to this book and WOW!!!!! I'm not saying it's Stevens' "MOM," but it's one of the greatest 4-mallet instructional books I've ever used! Ever! So get it! Do it now! Don't think about it! Just do it!